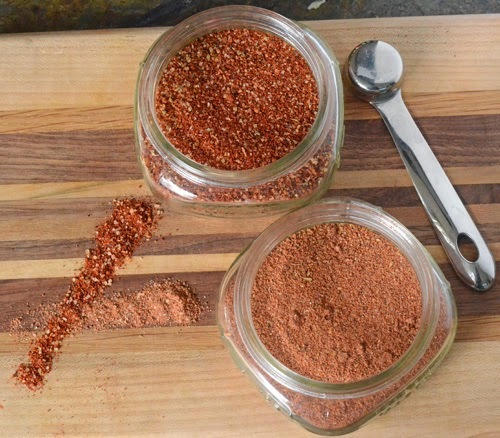 I came up with this barbecue rub earlier this summer and it has become my standard rub. I've used it in several recipes and find myself referring to it more often so I'm giving it a stand alone post. When I first make it, I will store it as is with it's coarse texture. I will use it like this for seasoning the exterior of my butts and first coat for ribs. In those cases I like the texture and it's on the meat long enough to rehydrate and soften the dried onions, garlic, and herbs. But for seasoning chicken, pork chops, tenderloins, etc I like to run it through a coffee grinder (dedicated only to spices) to get it in a fine texture. It goes on more evenly and it actually tastes different. Mix all ingredients and store in an airtight container. Grind for fine texture right before using. I've posted about this a few times this year. Chef and Pitmaster Adam Perry Lang has been traveling across the country sourcing handmade items for his ultimate tailgate. In this installment, Lang visits the hills of the Tullhoma, TN area. That's where I recently went to get The Warthog, beautiful country. Lang was here to learn hands on about the craftsmanship behind every batch of George Dickel Whiskey. Also, in case you didn't know, Lang's book, Serious Barbecue: Smoke, Char, Baste and Brush Your Way to Great Outdoor Cooking. , is back in print once again and available. You can ask just about any BBQ aficionado and they will tell you this particular book is a BBQ classic. It's in my personal top three, along with Raichlen's The Barbecue! Bible and Chris Lilly's Big Bob Gibson's BBQ Book: Recipes and Secrets from a Legendary Barbecue Joint . Hmmm that has got me thinking. I'm going to make Lang's Tri-Tip with Honey-Garlic Glaze from that book this week. Anyhoo - check out the video and if you want a copy of Serious Barbecue, pick it up now.